In pursuit of the biodiversity aspects of our vision, a key category of activities we work on is the conservation of endangered species and their sustaining habitats. At present our focus is primarily on fauna, but are increasingly developing our knowledge and interest in the conservation of plants and more specifically on that of disappearing agricultural cultivars. We work with a variety of animals including: birds, crocodiles, sea turtles, bats, and primates. Although some of these species are critically endangered and charismatic, like the Eastern Black-crested Gibbon, our conservation objective takes us into studying and promoting the protection of species that are still poorly understood, unglamorous, and that are gradually moving towards higher levels of endangerment, such as the small bat Myotis rickety. Presently we work with several species within family groups, all classified as endangered. On primates with eight species: Lar Carpenteri Gibbon, Mueller Gibbon, Eastern Black-crested Gibbon, Western Hoolock Gibbon, Eastern Hoolock Gibbon, Northern White-cheeked Gibbon, Francois Langur, and Tonkin Snub-nosed Monkey. On sea turtles we work with three species: Hawksbill Sea Turtle, Loggerhead Se Turtle, and Olive Ridley Sea Turtle. On birds, we work with four species: Giant Ibis, White-shouldered Ibis, and White-eared Night Heron. PRCF’s 2016-2020 Strategy calls for working towards reducing the level of endangerment from an established baseline, of at least 24 endangered species by 2020, with an average of four species in each of our six current countries of operation. PRCF Francois’ Langur conservation work (PRCF on Vimeo). PRCF’s conservation projects start with research into the conservation status of a species, in liaison with stakeholder local communities and relevant government officials. 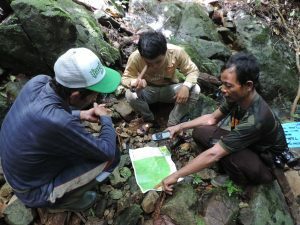 Most of our projects then involve collaborative management or community-based programs; where we work with local people and village organizations to achieve sustainable livelihoods and protect the target species. It is through the combination of these aspects of human-nature interactions that PRCF promotes species conservation. In line with our participatory approach in species conservation, village stakeholder communities are involved in all aspects of PRCF projects, from project design and planning, to project implementation and monitoring. Moreover, most of our project have an imbedded ‘exit-strategy’ within their design, whereby from the onset we are already planning on the long-term sustainability of the project, particularly by its assimilation by immediate stakeholders. Through our Species Conservation Program, we work towards mediating and reducing the present loss of biological diversity, by promoting long-lasting and mutually beneficial interactions between people and natural resources.